Papa’s Meat Market is the only Fully Licensed provider of Certified Angus Beef in the Area! Papa’s Meat Market only uses Certified Angus Beef ® that we feel is a superior product, incredibly flavorful, tender and juicy because of the high amounts of marbling in every cut. Since 1978, only one brand of beef has promised and delivered flavorful, tender, juicy cuts of beef. The Certified Angus Beef ® brand, as the original brand of fresh beef, has set the bar for high quality beef and premium programs. The success of the brand has spurred a cloud of “Angus confusion,” as other programs tout similar Angus names. However, not all Angus beef is created equal. Each Angus program varies in its set of standards, not always delivering consumers the quality they expect. That’s where the Certified Angus Beef ® brand shines, consistently providing consumers the high-quality beef they crave. • Founded in 1978 by Angus cattle producers, the Certified Angus Beef ® brand is a not-for-profit subsidiary of – and the only brand owned by – the American Angus Association® and its 33,000 rancher members. • “Angus” is a breed of cattle. No other breed of cattle can match Angus’ marbling and ability to hit the high-quality target. brand is its quality requirements or specifications. While there are many brands of Angus beef, each program has different quality specifications – or none at all. marbling, tenderness and consistency. USDA graders determine whether beef meets all of those standards and is eligible for the brand. • Only USDA graders can evaluate Angus-influenced cattle for the Certified Angus Beef ® brand. This ensures completely unbiased approval. • The Certified Angus Beef ® brand is the only brand that tracks every pound of beef from USDA approval until it is sold to consumers. • Experts ranging from ranchers to packers to distributors to retailers and top chefs trust the brand and understand its value to their business – and their customers. • To ensure consistent quality and mouthwatering flavor, consumers look for the premium black, gold and red label carrying the Certified Angus Beef ® brand name. The Certified Angus Beef ® brand is the best Angus beef available. The brand relies on a set of 10 strict quality specifications – developed by leading scientists, researchers and academics – to consistently deliver a superior beef-eating experience. The brand begins with Angus-influenced cattle, which are known to produce more highly marbled beef. Ten additional science-based specifications select only the best beef available. In fact, less than 8% of all beef earns the brand’s premium name. 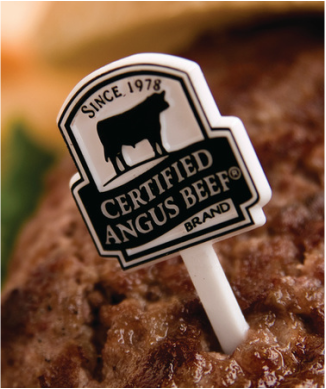 The Certified Angus Beef ® brand also touts the industry’s most extensive tracking system, tracing the product from the U.S. Department of Agriculture (USDA) approval to restaurants and grocery stores around the globe. Thanks to this system, consumers can purchase the mouthwatering brand they know they’ll consistently enjoy.